Pesticides, polychlorinated biphenyls (PCBs), and pharmaceuticals are a worldwide contamination problem. Several major US water bodies, such as the Hudson River, St. Lawrence River, Fox River and the Great Lakes have been contaminated with PCBs from industries discharging into these water bodies for decades. For example, from approximately 1947 to 1977, the General Electric Company (GE) discharged as much as 1.3 million pounds of PCBs from its capacitor manufacturing plants at the Hudson Falls and Fort Edward facilities into the Hudson River. GE is now paying for clean-up and monitoring efforts. Studies have confirmed that many of the contaminants that were previously discharged into the environment have undergone degradation, weathering, vaporization and sedimentation. The contaminants may no longer resemble the original mixture and pattern. In particular, PCB contaminants may still be present, but in different amounts and altered patterns, called congeners. With the improvement of analytical techniques over the past 25 years, investigators are now looking closer at individual congeners. With these investigations, a shift in analysis has occurred from total contaminants analysis to congener specific analysis. This development has led to a greater need for versatility in PCB analysis. Because many of these contaminants are long lived in the environment and bio-accumulate throughout the food chain, numerous regulations have been developed and implemented. Demands have been placed upon environmental testing laboratories to increase sample throughput, shorten sample turnaround times, achieve reproducible results, and provide lower detection limits. The analysis of water for a full spectrum of contaminants has proved to be very challenging. With tighter regulation and lower-level detection limits being required by regulating authorities, analytical laboratories have to find improved methods of extraction. Traditional methodologies typically involve a manual separation funnel in a method called Liquid-Liquid Extraction (LLE) or a more exhaustive extraction technique called Continuous Liquid-Liquid Extraction (CLLE). These methods require a large volume of solvent, such as dichloromethane, in a process that causes contaminants to transfer from the water sample to the solvent. The extract is then concentrated through an evaporation step; solvent is exchanged with hexane, with the final extract now ready for analysis. These methods were originally developed for analysis of all types of water samples and worked very well for samples with high concentrations of contaminants. However, with the necessity of trace analysis for PCBs and other contaminants present in water, these methods are proving to be outdated and inadequate. They are labor intensive, use large amounts of solvent and require contaminant-free glassware. This limits the number of samples a laboratory can process in a day, makes reproducible results difficult and does not allow for lower detection limits. 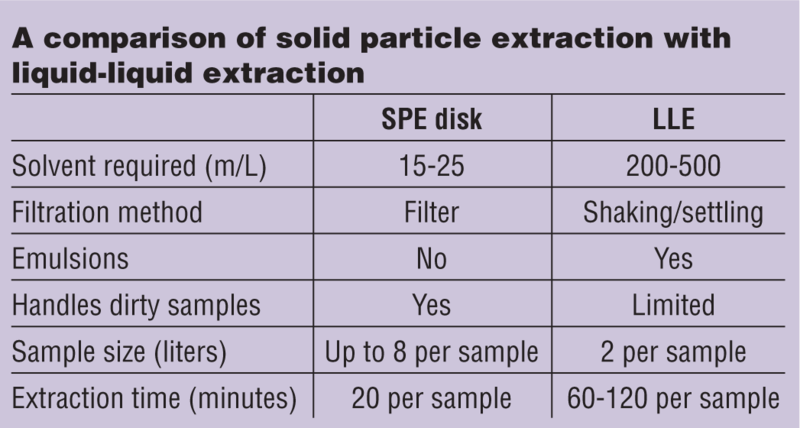 The implementation of an optimized and automated Solid Phase Extraction (SPE) method overcomes all these issues. The development of automated extraction and cleanup processes has resulted in less solvent use, glassware and extraction time, while producing trace detection at a much lower-method detection limit (MDL.) This last issue has become the most important. Liquid-Liquid Extraction (LLE). Liquid-Liquid Extraction has been the standard extraction method mandated by the US EPA for the last 30 years. The method involves separating compounds based on their relative solubility in two different liquids that cannot be mixed (e.g., oil and water), one being the water being sampled and the other being an organic solvent. LLE is the extraction, or transfer, of the contaminant from the water sample to the solvent. It requires an analyst to add 60 mL of solvent (usually methylene chloride) for each liter of the water sample. The analyst then shakes the liquids vigorously to allow solutes to come to equilibrium between the two liquids. They are then allowed to settle; the methylene chloride, which now contains the contaminants of interest, settles to the bottom of the funnel. The solvent/contaminant mixture is removed through the bottom of the separation funnel. This process is repeated two more times, each with the addition of 60 mL of solvent. The nearly 200 mL of solvent/contaminant mixture is collected and then evaporated in order to concentrate the organic contaminants. If laboratory safety measures are not implemented, the analyst is exposed to methylene chloride vapors, which are potentially hazardous. Also, methylene chloride waste must be properly and safely disposed of. In summary, at the end of the extracting procedure, only one mL of solvent is left. The 199 extra mLs of solvents that have evaporated typically go right up the fume hood and into the atmosphere, which may create additional pollution if not diluted in large volumes of air. The final irony is that it may get back into the water streams that were originally being sampled! This problem is exacerbated by the need to test for smaller trace amounts. Solid Phase Extraction (SPE). SPE systems are capable of processing aqueous samples directly from their original containers using a filtration process with pretreated sorbent disks. Once initiated, the extraction unit sequentially delivers all the necessary solvents to precondition the sorbent material within the SPE disk, then passes the water sample through the disk and, after a preset air-dry time, extracts the sorbed analytes from the disk into a collection vessel using the required amounts of solvents. The automated SPE methodology allows the analyst to extract up to eight samples at one time and uses a much smaller volume of solvents. This reduces the cost per sample, analyst time per sample and contact with solvents and solvent emissions to the environment, all while successfully capturing smaller trace amounts. A number of factors can be used to compare these two methods: MDLs; amount of solvent required; amount of time to perform each test; cost effects on the work environment; glassware required; market considerations and effects on the environment (see the comparison table). 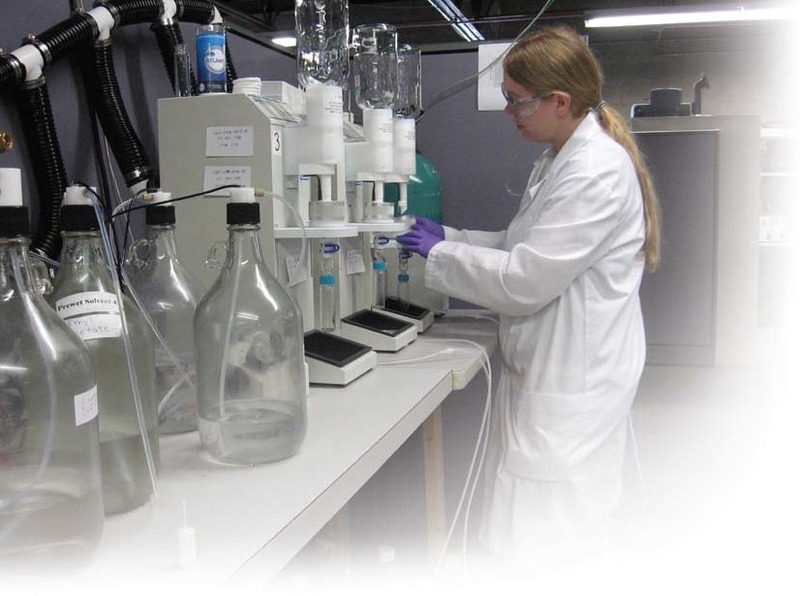 Given the growing environmental concerns regarding pollutants in the global water supply, and as a result of recent advances in the sensitivity and throughput of analytical measurement technologies, it has become a primary motivator for many environmental laboratories to increase the total number of samples analyzed in an effort to determine the presence of harmful contaminants in water at much lower levels than in the past. A primary feature of SPE supporting this initiative lies in its unique ability to process relatively large volumes of contaminant water at very high flowrates. In some cases, the speed to extract analytes of interest from a given water sample can be 10 to 15 times faster using SPE compared with traditional methods. Also, water samples containing sediment and other particulates can be processed without special considerations. The net result is more accurate data, simpler process parameters and more samples analyzed per unit of time. The key cost factor in performing each test is the amount of solvent required to perform the particular test. Utilizing an LLE/CLLE method can require upwards of 180 to 500 mL of solvent, whereas the SPE method would use only 30 to 35 mL, an 80 to 90 percent reduction. In addition, waste solvent must be properly disposed of. Using a cost of $165 (USD) per disposal drum, an estimated two drums per month can yield a savings of $3,150 per year. The SPE method, through the reduction of solvent use, would create a safer working environment for analysts by reducing solvent exposure and inhalation. SPE is a closed system and can be situated in a fume hood, or even used on a lab bench. Evaporating systems that are requested with the SPE system are also closed systems, allowing the lab to trap the small amount of solvent that is generated during the evaporation process. Another factor affecting cost per sample is the amount of special glassware that is used by each method. The typical LLE method uses a separation funnel, Kuderna-Danish flask, micro- and/or macro-Synder columns, ampules, Teflon stopper and funnel for a total glassware setup cost of over $300. If the laboratory maintains ten of these setups, it represents $3,000 in glassware. Glassware for CLLE is even more complex and costly. SPE eliminates the need for nearly all of this glassware. In fact, the extraction process can be done using the same bottle used to collect the sample. Another major factor is the amount of time required to perform each test. SPE takes 3.5 hours on average and requires one technician, whereas separation funnel takes an average 10 hours and requires two technicians, while CLLE takes an average of seven hours and requires one technician. The reduced time associated with SPE testing will allow the laboratory to handle a greater volume of samples per day, and to meet deadlines for larger projects. 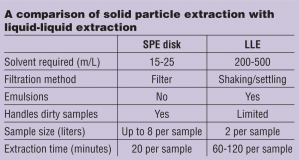 SPE evaporating units used to concentrate sample extracts also require less labor time and costs. With LLE, samples are placed in water baths on hot plates and the solvent is boiled off. An analyst must be in attendance to prevent samples from boiling dry or ’popping’, resulting in the loss of analytes of interest. Using an automated evaporating process with endpoint detection and shut-off will prevent the sample from going dry. The evaporator can hold six samples at a time and operates with minimal supervision. Also, SPE will help with tests that are sensitive to common laboratory interferences. For example, some tests can easily be contaminated by the chemicals and cleaners used for the glassware. In some cases, labs have had to raise the detection limit of the samples in order to accommodate the interferences. Because the SPE extractor eliminates much of the glassware needed to perform extractions, the chances of interferences are greatly reduced. The SPE extractor, being more efficient and having less associated cost would allow labs to offer a competitive price for jobs that they might otherwise have to refuse. Reduced costs also allow the lab to create profit in growing markets or to create new niche markets. Additionally, the SPE extractor would allow labs to increase customer satisfaction by allowing increased daily extractions, increased sample throughput, and reduced sample turnaround time and increased ability to meet more clients’ rush requests. Utilization and cleaning of large, two-liter separation funnels and other glassware is completely eliminated by SPE. Samples can be processed in 35 minutes or less, saving considerable labor costs for extraction. The SPE procedure eliminates 80 to 90 percent of solvents when compared with conventional methods, exhibiting a significant reduction in purchase and disposal costs of chlorinated solvents, such as methylene chloride. SPE greatly increases safety in the laboratory by reducing potential exposure of workers to solvents, because by automating the entire solid-phase extraction process, the operator does not need to be positioned near the instrument. SPE achieves low MDLs, as little as one nanogram per liter (one part per trillion) for eight-liter samples. Bob Johnson is the Founder and CEO of Horizon Technology, Inc. Before founding Horizon, he worked for Zymark Corporation and was involved with sales, ultimately being the original Product Manager for the TurboVap Evaporator System. Prior to Zymark, Johnson worked as a Chromatography Specialist for Varian Instruments, specializing in GCs and data systems. He has a B.S. Degree in chemistry and an M.S. Degree in chemical oceanography. Johnson can be reached via phone, (603) 893-3663 or email, rsjohnson@horizontechinc.com. Horizon Technology is a leading manufacturer of automated sample preparation systems for the analysis of organic compounds in aqueous samples and oil and grease testing. Environmental labs who follow US EPA methods for semi-volatile organics, oil and grease, DROs, TPH, pesticides and explosives have found Horizon’s complete, automated sample preparation systems and consumables reduce sample turnaround times, improve high quality and consistency of results, reduce solvent usage and disposal costs and limit the exposure to solvents.